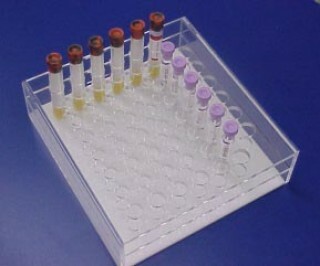 Process blood specimens easily and conveniently with this blood culture rack. Up to 12 patient specimens can be processed at one time. Heavy-duty clear acrylic can be easily cleaned. Holes are laid out to allow the technician to dilute specimen from right to left, left to right or top down. Racks have 16mm holes for patient tubes on all outside rows except for the bottom row. All other holes have a 13mm dia. to fit standard 12 x 75mm disposable culture tube. Small unit= 6 each, 13mm holes down x 6 each 13mm holes across.